NorthLink Ferries provide a daily ro-ro service to Shetland from Aberdeen which, leaving Aberdeen in the late afternoon and arriving in Lerwick around 0730. 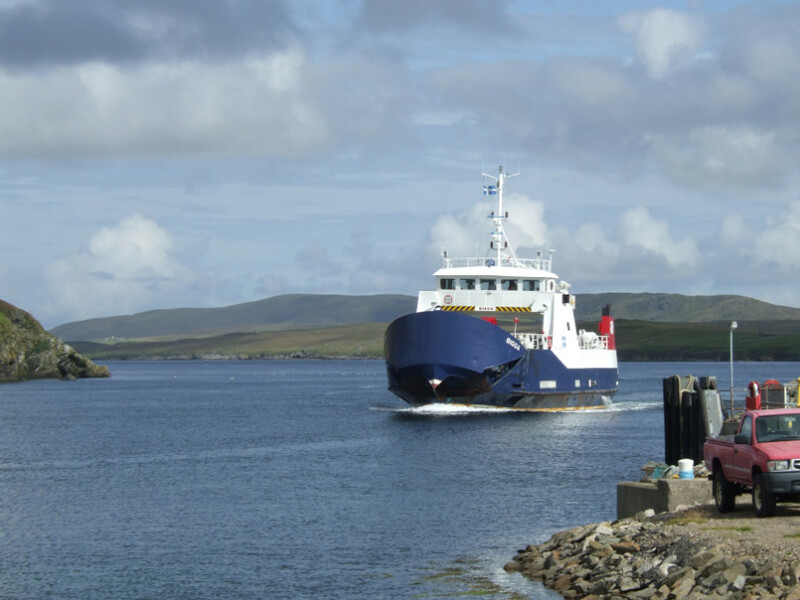 The ferry journey takes either 12 or 14 hours depending on whether the service calls at Kirkwall (Orkney). Cabins are available on all services to Lerwick. Kennels are also available for pets. Contact www.northlinkferries.co.uk for more information. You can now subscribe to a free SMS and Email service run by the local council to receive free service status alerts. Following Flybe's recent decision to pull out of routes to Shetland, with last flights scheduled for 7th January 2018, Loganair will be the sole operator on the route. They operate daily flights from Glasgow, Edinburgh, Inverness, Aberdeen & Kirkwall to Sumburgh Airport, at the South end of the Shetland mainland. Loganair have code share arrangements with BMI and British Airways. Direct flights to and from Manchester on Saturdays are planned for 2018 as are direct flights to and from Bergen during summer 2018. Flights via Inverness to Dublin are also available.Please note that Loganair are currently reviewing their schedules for 2018 following Flybe's departure and you should contact them directly for the latest information. After arriving, at Sumburgh you should head north towards Lerwick on the A970 before following the directions listed below. The information desk at Sumburgh can advise about car hire, buses and taxis. The approximately driving time from Sumburgh to the Toft ferry, via Lerwick is 1hour, 15 minutes. Star rent a car have a hire desk in Sumburgh arrivals area. Bolts car hire can also supply cars for pick up at the airport. Zoom imageFerry to Fetlar from Yell. Fetlar is North of Lerwick, approximately 45 miles by road, and involves two inter-island ferry crossings. You should allow at least 45 minutes for the drive north along the A970 from Lerwick to Toft, where the ferry departs on the 20-minute journey across Yell Sound to Ulsta at the south end of Yell. 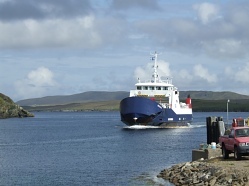 The modern ro-ro ferries are operated by Shetland Islands Council. They sail at regular intervals, but pre-booking is advised especially when travelling to Fetlar. When you arrive at Toft ferry terminal enetr lane 1 if booked or lane 2 if not booked. For details of the ferry timetables please see: www.shetland.gov.uk/ferries/timetable.asp. (Please note that ferry timetables are changed in the Spring and Autumn). If you find this timetable confusing (most people do !) you can use the Fetlar Primary Schools easy to understand timetable which covers ferries and buses within Shetland, to and from Fetlar. Note: SIC ferries ask that vehicles are ready to board at least five minutes before departure time. When on board you must stay in your vehicle until the appropriate fare has been paid on this service. On arrival at Ulsta in Yell you should to follow the A968 to Gutcher. This is at least a 25 minute drive, and you should be aware that the sheep will occasionally wander across the road in front of you. If you have time, consider taking the more scenic route, turning right just after driving away from the Ulsta terminal towards Burravoe instead of driving directly north to Mid Yell. As you travel up the East side of the island you will get your first views of Fetlar. On arrival at Gutcher you must select your lane carefully as ferries go to both Unst & Fetlar from this pier. For travel to Fetlar enter lane 3 if booked or lane 4 if not booked. This lane allocation applies even if you are travelling through to Fetlar via Unst. Please note lanes 1 & 2 are for Unst traffic only. When boarding the Bluemull Sound ferry always check with the ferry crew that the ferry is going to the destination you require. If the timetable refers to a connection then you may have to go on a ferry to Unst and then stay on the same boat until it arrives at Hamars Ness in Fetlar. Occasionally you may need to reverse off the ferry. Please be aware that there is no fuel available on Fetlar so top up if necessary before you get to the island. Search on the relevant app store for "Shetland Travel infomation"